I've always had great respect for the Swedes, for a host of different reasons. For one thing, Sweden has continually reinvented itself. Sweden was also the first European country I ever visited, back in 1987, although I've returned a number of times since then. Aside from being one of Europe's most affluent and prosperous countries, it's also one of the most Internet-penetrated countries on earth, and I follow a number of Swedish diabetes bloggers even though I don't speak any Swedish (thanks to Google translate for that!). Beneath the surface, I think relatively few Americans realize that Sweden is the third largest cultural exporter in the world, surpassed only by the US and the UK. For example, all of Britney Spears' early hits were written by Swedish songwriters. The country has given us many popular musicians and/or bands, including ABBA ("Dancing Queen", countless others), Europe (perhaps known for the song "The Final Countdown"), Neneh Cherry ("Buffalo Stance"), Ace of Base ("All That She Wants"), Roxette ("Listen to Your Heart", among others), The Cardigans ("Lovefool") and countless others, yet few Americans even realize these artists come from Sweden. Countless female (and male) models have hailed from Sweden. The country rules ice hockey (although the Canadians might beg to differ). Sweden gave us IKEA and H&M, and countless modern designers. Even reality TV was invented in Sweden; as "Survivor" was actually invented by Swedish television, not Hollywood execs. That's a pretty impressive track record considering the fact that the country has fewer than 10 million residents, and English isn’t even a native language! I also doubt that many Americans realize that Sweden had its own real estate bubble that went bust in the 1990's, yet the country did a much better job of implementing necessary reforms than, say, Japan, for example, as some in Japan call the 1990's as "the lost decade"). In 2008, a New York Times journalist wrote "Stopping a Financial Crisis, the Swedish Way", although the U.S. has so far failed to follow the Swedish reform model, which I think is probably a mistake, but only time will tell. But Sweden also ranks near the top in terms of type 1 diabetes prevalence (exceeded only by neighboring Finland), so the country has particular interest in eradicating this type of diabetes and its complications. I continue to seek out information about how Swedish biotechnology companies are working to change diabetes treatment. One is Creative Peptides, which is pursuing approval for C-Peptide, once believed to be a useless byproduct of insulin synthesis, but subsequently proven to have a number of therapeutic benefits in its own right, such as helping to prevent and/or eradicate neuropathy and possibly as a factor in cardiovascular disease prevention. But this article isn't about Creative Peptides; it's about another Swedish biotech firm that I think could have an even more profound impact on treatment for type 1 diabetes. 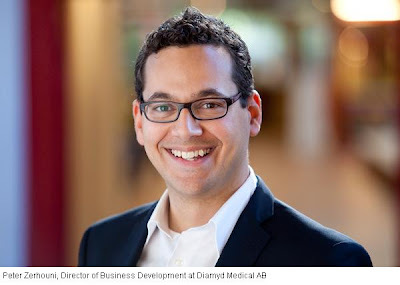 A little over month ago (on March 26, 2010), I had the pleasure of speaking with Peter Zerhouni, who is the Director of Business Development at Diamyd Medical AB (the "AB" is akin to what we in the U.S. call "Inc.", that means it's legal entity that's incorporated) which is based in Stockholm, Sweden. For those of you who aren't familiar with Diamyd, it's a biopharmaceutical company in the field of diabetes, with particular focus on type 1. More specifically, the company’s current research and development concentrates on autoimmune diabetes and complications related to diabetes. The company’s vision is to one day be able to prevent AND cure the autoimmune form of diabetes, which makes them a bit different from other companies who are pursuing treatments to arrest autoimmune diabetes. The ultimate objective is to be able to treat children, adolescents and adults with type 1 diabetes and to vaccinate those at risk in order to prevent the disease from breaking out. After several years of successful research and good results, the company believes that the diabetes vaccine they call Diamyd® significantly slows the disease process, but I’m not sure how many PWD’s (persons with diabetes) are aware it also has potential to be applied not only to the not yet diagnosed or newly diagnosed, but also those with longstanding type 1 diabetes. I am most likely over-simplifying things quite a bit for clarity, but the Diamyd vaccine pretty much accomplishes the same thing as some of the other autoimmune treatments for type 1 diabetes now in development do (among them antibody treatments Macrogenics’/Lilly’s teplizumab, Tolerx’s/GlaxoSmithKline’s otelixizumab AND even the TB vaccine [BCG] being trialed by Dr. Denise Faustman and David Nathan at Massachusetts General Hospital which aims to do the same). Unlike these other, now-in-development autoimmunity treatments for type 1 diabetes, which work by killing off the autoreactive T-Cells responsible for beta cell destruction (as well as some innocent bystanders along with them), Diamyd is thought to stimulate another class of T-Cells (regulatory T-Cells) that selectively calms down their autoreactive friends. This means Diamyd may be a more specific route to correcting the body's errant immune system that causes type 1 diabetes in the first place. For this reason, it is viewed by a number of researchers as more than simply a vaccine – the prescription (assuming it is ultimately approved by the FDA) could also potentially be expanded to longstanding patients as well. The mechanisms on how each of these autoimmunity treatments these work specifically is best reviewed in the companies’ scientific literature, but that’s my general understanding as a layman (thanks to some valuable input from Peter Zerhouni at Diamyd!). At its core, the Diamyd vaccine is based on what’s known as glutamic acid decarboxylase (GAD). What’s that? Well, the active substance in Diamyd® is what’s known as GAD65 (technically, it’s the 65 kDa isoform of glutamic acid decarboxylase, which probably means nothing to any of my readers, but I digress …). That’s essentially a human enzyme that has an important role in the nervous system and in several nervous system diseases (e.g. Parkinson’s disease and chronic pain). But endogenous GAD65 is also found in the insulin-producing beta cells of the pancreas, although its function at this site is not yet been fully established, as well as in nerve and brain tissues. As noted, its role in beta cells is not fully understood, but researchers do know that GAD65 catalyzes the conversion of the amino acid glutamate to GABA, which is a neurotransmitter, in nerve cells. GAD65 is also considered an important candidate drug in several neurological diseases, including Parkinson’s disease and chronic pain. One need not know the precise role of GAD65 in the beta cells to understand how it impacts the autoimmune response to those cells. It’s clear that GAD65 is one of the most important targets when the immune system attacks the insulin producing beta cells in autoimmune diabetes, thus its use as a type 1 diabetes vaccine among at-risk patients. By introducing the enzyme to the immune system before it wreaks havoc on a person’s beta cells, the vaccine can potentially induce what’s known as "self-tolerance" to their own beta cells, which is THE core problem in type 1 diabetes, not a lack of insulin per se. Treatment with Diamyd® is believed to induce tolerance to GAD65, thereby intervening in the autoimmune response/attack and therefore preserving the body’s capacity to produce at least some of their own insulin in patients with autoimmune diabetes, i.e. type 1 diabetes and LADA. In summary, GAD65 is known to be a major autoantigen in autoimmune (type 1) diabetes. 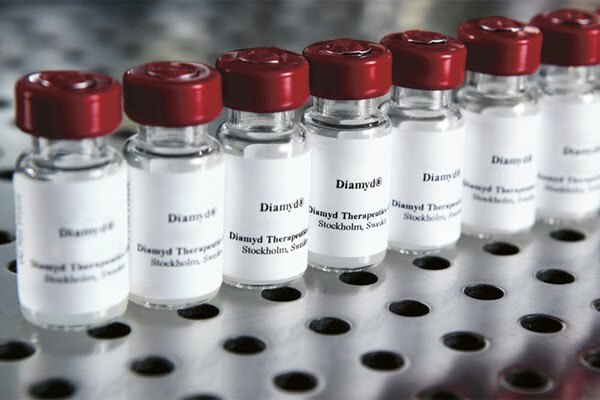 The Diamyd® vaccine is intended to induce immunotolerization in patients with autoimmune diabetes to slow or prevent the destruction of pancreatic beta cells going forward, and to maintain some endogenous secretion of insulin, which has been proven unequivocally to have long-term patient benefits by enabling easier glycemic control, and providing significant protection from hypoglycemia, a major problem that plagues many patients with type 1 diabetes (but is far less common in type 2 diabetes due to residual counterregulatory function). Diamyd: An "Orphan" Drug? Yes, According to the FDA! In any event, I reached out to Diamyd to discuss a fairly recent development that culminated with a press release announcement last month that Diamyd’s type 1 diabetes vaccine had been granted a designation by the U.S. Food and Drug Administration as an "Orphan Drug" intended to treat rare diseases. This development is important for a number of reasons. Historically, the approval time for Orphan Drugs has been shorter than the approval time for other drugs in the U.S. Although the approval criteria is NOT different than it is for other drugs, applicants for orphan drugs do have the added benefit of having an ongoing dialogue with the FDA, which helps applicants to avoid sometimes lengthy delays in the application that might occur in the event that there is a question on the application or on the clinical trial results, and what those actually mean. There is also a staff at the FDA that can assist orphan drug developers through the entire application process. Plus, if approved, the drug gets 7 years’ exclusivity from the FDA on top of any patent protection that the product may be eligible for. It also eliminates FDA filing and registration fees, and provides tax incentives for as much as 50% of the clinical development costs. But Type 1 Diabetes Isn’t Exactly "Rare", So Why The Designation As Such? Although there are some 7,000 rare diseases according to the FDA’s definition, the reason this designation for Diamyd is so noteworthy is because ordinarily, a rare disease is one that affects fewer than 200,000 individuals. In the case of type 1 diabetes, depending on whose estimates one uses (the U.S. Centers for Disease Control does not gather information based on diabetes type, and there is no nationwide registry for people with the disease, so solid statistics are clearly lacking) there are anywhere from 1.5 million to 3 million Americans living with type 1 diabetes in the U.S. today (and we know that the incidence is growing) – far more than most other rare diseases according to the FDA's definition. The orphan drug designation usually involves a very limited subset of patients, and in the case of type 1 diabetes, that is most often newly-diagnosed patients. But if the Diamyd treatment is approved, it is foreseeable that the applicable patient universe for the treatment could possibly be expanded to include patients with longstanding type 1, which is fantastic, because any research analyst will confirm that it’s faster, easier and usually cheaper to expand the applicability of an already-approved drug to other groups of patients than it is to get a brand new drug approved. Diamyd isn't exactly alone in getting Orphan Drug designation for a type 1 autoimmunity treatment in development. Right now, there are a few other drug candidates that have also received an orphan drug designation, among them teplizumab which was developed by Macrogenics, Inc. along with it's big Pharma partner Eli Lilly & Co., and otelixizumab which was developed by Tolerx, Inc. with big Pharma partner GSK/GlaxoSmithKline. In the case of teplizumab and otelixizumab (both of which are anti-CD3 antibodies meant to address the autoimmune response responsible for type 1 diabetes), these drugs have been granted the orphan drug designation only for "new onset" or "recent onset" type 1 diabetes patients. "With Residual Beta Cell Function" Is VERY Different From "Newly Diagnosed"
Diamyd’s orphan drug designation differs from both of them in that it has been granted orphan drug designation for individuals with type 1 diabetes "with residual beta cell function", which is a very important difference, as it could potentially be expanded to include certain any patients with longstanding type 1 diabetes provided they have some remaining beta cell function. Now, I should advise that my impression is that other autoimmunity treatments in development might need to submit additional clinical trial data in order to reclassify their eligible universe for the treatments, or else have doctors prescribe it off-label (doctors can already do that on virtually any FDA approved drug), a practice that the FDA has recently cracked down on after years of widespread abuse by the pharmaceutical and biotechnology industries, but I should point out that Mr. Zerhouni did not suggest this, rather that is merely my personal impression of how these definitions differ slightly. Mr. Zerhouni did tell me that the FDA has not specified exactly how that beta cell functionality must be measured, but would most likely use C-Peptide level and possibly some other criteria. On a related tangent, it is worth noting that Exsulin/Kinexum Therapeutics' Dr. G. Alexander Fleming, who was for 12 years the Head of the Metabolic Group including diabetes at the FDA, and was involved in the approvals for ALL diabetes drugs approved by the FDA during the 1990’s and also led professional education at the FDA's CDER [Center for Drug Evaluation and Research] knows only too well, the FDA has struggled with defining criteria for evaluating the efficacy of curative therapies for type 1 diabetes (see his paper here for more details) for a number of years, and the FDA has yet to specify exactly what it will need to consider to measure residual beta cell function. In my personal opinion, the reason for this is because the FDA has overwhelmingly relied on using "surrogate" endpoints for diabetes treatments which has been measured almost exclusively by using HbA1c, rather than taking a more global view of how medicines for this disease should really be evaluated. 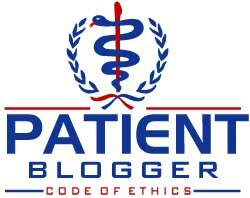 But there seems to be growing pressure from within the medical community on the FDA to change that review criteria. This was prompted, at least in part, by a commentary article published in the September 29, 2007 edition of The Lancet entitled "Patient-important outcomes in diabetes—time for consensus" in which the authors, largely from the Mayo Clinic, reported that a majority of diabetes clinical trials in the U.S. ignore virtually everything except glycemic control (see my previous post on this topic here). Similarly, the FDA has rightly been criticized for looking only at HbA1c, especially to fast-track approvals on drugs like Avandia to treat type 2 diabetes, in spite of the FDA having some evidence that Avandia actually killed certain patients, suggesting the use of surrogates alone is deeply flawed. It is my hope that this growing pressure on the FDA, combined with the advent of new treatments that address the root cause rather than simply the symptoms of the disease, will result in clearer review criteria going forward. However, to confirm Mr. Zerhouni's presumption, a 2001 workshop did seem to validate the use of C-Peptide as an appropriate measurement (see here for that paper) of residual beta cell function. However, because orphan drugs have more guidance from FDA regulators, this will likely be decided as the Phase III human clinical trial results are analyzed and reviewed. Another difference with Diamyd seems to be the LADA (latent autoimmune diabetes in adults) patient audience because Diamyd has already studied this group with GAD in its earlier trials. Since this group has a slower progression of beta cell destruction, Diamyd has learned a lot about the effects of GAD working for LADA patients in the earlier Phase I and Phase II trials, and that could potentially have implications for future trials helping this group as well. Diamyd has already finished both Phase I and Phase II human clinical trials successfully, reporting positive results from a completed 30-month randomized double-blind placebo controlled Phase II study of 70 children and adolescents with type 1 diabetes. In the Phase II trial, significant long-term efficacy was demonstrated in preserving ongoing beta cell function, i.e. endogenous insulin-producing capacity. The treatment was also reportedly well-received by patients, their doctors and family members. The results also strongly support the safety of Diamyd, with no serious side effects related to the treatment reported. The study was published in the fall of 2008 in The New England Journal of Medicine. In March 2010, Diamyd announced that it had recruited 100 study participants at 33 diabetes centers in the USA (and more sites will be added) in the ongoing U.S. Phase III study, called DiaPrevent, which is part of a global Phase III program with the company's lead drug candidate. Collectively, Diamyd has already enrolled more than 430 children newly-diagnosed patients with type 1 diabetes in Europe and the USA. In the meantime, Diamyd, like all biotech startups, is losing money, but angel investors tend to view progress towards the company’s business goal(s) as a more important measure of the company’s success thus far. The Phase III trial is largest trial required thus far, but Mr. Zerhouni mentioned that most parents they speak with seem gratified by their child’s participation in the study. Given that, if I had to surmise, I would not expect any major delays in recruiting participation in this trial. "We have exciting times ahead of us with only one year to go before we have the results from our European Phase III study. Our hard work starts to pay off. Besides our ongoing partnership discussions, we will primarily focus on completing the Phase III studies and prepare for market launch of Diamyd®." I think all of us should look for great things to come from this company, and I personally wish them success, not only from a financial perspective, but also for having a product that could benefit all people with type 1 diabetes. I expect great things from Diamyd! Thanks for an interesting post and the kind words about Sweden. How do you say "Scott, Outstanding post!" in Swedish? But seriously, thorough, filled with info and really well done! Thanks for a fascinating, detailed and understandable analysis of Diamyd. You remain one of my all time favorites. Yes type 1 diabetes is on the rise. Its high time that we need a cure for this disease, coz seeing small kids who dont understand why they are getting injections four times a day and restricted not to eat certain food, going through this really breaks heart. My son (who is typeI with celiac, when he watch certain advertisements for food items asks me " Mamma when I'll be OK than I can eat this, only in small quatity". I feel strongly the need to speed up the research, though there has been progress the pace is very slow. My daughter has just begun to participate in Phase III (USA). I hope and pray she gets this drug and not the placebo. I really think this is it. God Bless scientists who are working for cures!